What Happened To The Hi Fly A380? Last month we reported in great detail Hi Fly’s A380 crashing into a landing bridge in Paris. And now its time for an update on our favorite wet lease aircraft. The journey of Hi Fly’s A380 so far. It began with humble beginnings, the A380 was working under the livery of Singapore Airlines and ended its lease. Singapore had additional A380’s that were newer and more fuel efficient and decided to swap out four of their older craft. Many airlines have not had tremendous success with the A380 and many suspect that it might be curtains for the giant jumbo killer (However, rumor has it that Lufthansa might be about to order 15 more of the planes!). Hi Fly of course is a wet leasing airline. This means that unlike regular chartering, Hi Fly actually supplies way more than just a plane. They provide crew, service, fuel, insurance and even an airline certificate. That means that you could feasibly start up an airline from scratch just by hiring them tomorrow to run a route. The A380 received by Hi Fly from Singapore Airlines was first painted white. 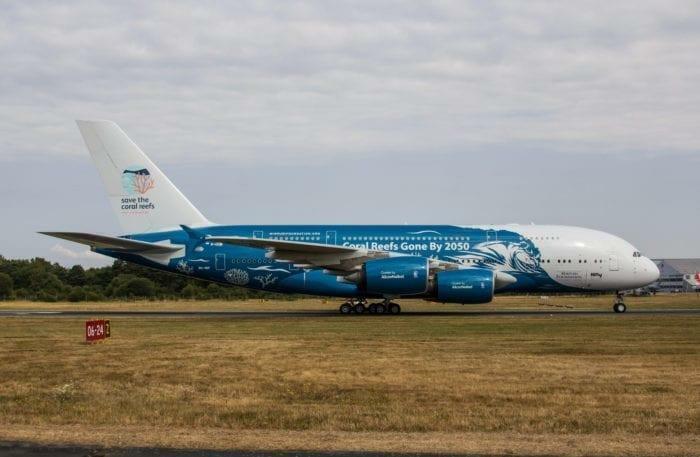 When a second-hand A380 came up on the market, Hi Fly saw an opportunity and bought it! It instantly got picked up as Boeing 787 Dreamliners had engine failures left and right (Other airlines who couldn’t get the A380 settled for wet leasing Air Belgium A340’s). 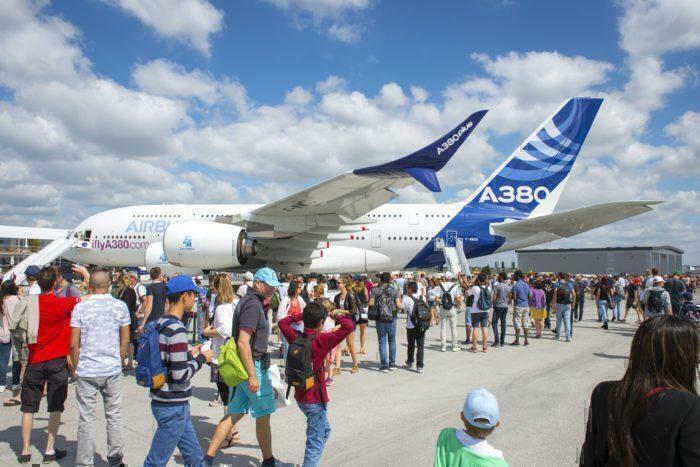 So far the A380 has seen action flying all over the world. It was first hired by Thomas Cook. Then it doubled as a 787 for Norwegian Air’s London to New York route. It was not without controversy, with it initially running 4 hours late and costing Norwegian Air (Or their sponsor for the plane) millions. But it did allow some passengers to experience a first-class suite on an A380 for incredible prices. Hi Fly A380 first class. Originally the same layout as Singapore, Hi Fly never removed the first class suites. Then it went tropical flying to the island of Reunion off the coast of Madagascar, under Air Austral. Where is the Hi Fly A380 now? Initially, it was clear that it was not damaged. But to ensure that the plane was safe it was flown without passengers to Toulouse for maintenance. Curious as ever, Simple Flying got in touch with Hi Fly to ask where their A380 was and received this reply. 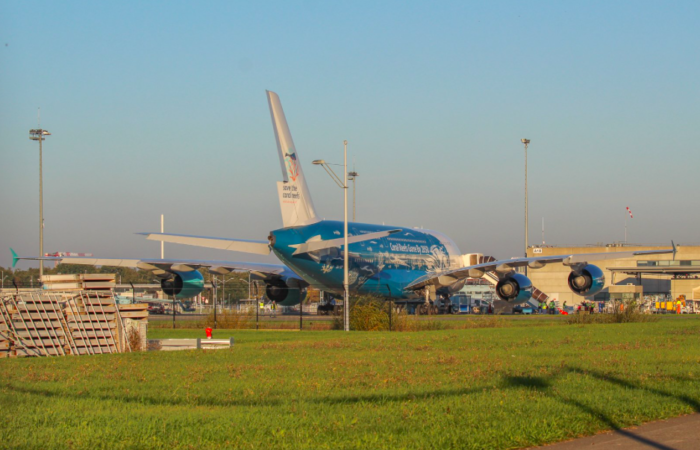 So far it seems its still there at the main Airbus testing airport in France. Where will it be going next? It has been rumored that the next company to hire it would be charting flights to Israel after Hi Fly enquired if the runways could take an A380. Turkish airlines – they’ve always been rumored to be looking at purchasing a few A380s, and this could be the perfect chance for them to trial the craft and see if it integrates well into their airline. They are also not doing very well financially so it may not make economic sense. Swiss airlines – currently running a twice-daily service to Miami, they could easily swap out their two A330s for one Airbus A380, allowing them to redeploy the other plane somewhere else. Virgin Atlantic – They are currently having problems with their 787 Dreamliners, thus would be very happy to replace them with an A380. Who do you think should hire the A380? Feature image by Clément Alloing‏ @CAlloing. I think PIA should use the A380 from Islamabad to London & Manchester. Great idea! Plenty of demand for that route! And FlightRadar 24 shows it still at Toulouse at 8 December 2018. Looks like the plane had his last revenue flight mid September. The 9H-MIP, after doing a flight to US with Norwegian Air due to Gatwick airport incident, is now at Beja Airport Portugal (BYJ) parked and ready to fly. Seems like 9H-MIP doesn’t have a lot charters upcomming? The flight history seems pretty empty? Any news about that? Ist still in maintenance?